I've read so many negative reviews about this book but I still decided to buy one and read it, I wanna figure out myself why and to be honest, I like this book. Aside from the awesome cover, the story is interesting, so much science fiction which I appreciate because it's one of my favorite genre. Despite of the flaws of the book (I admit there's some), it's cool! I got a little bit confused between Icons and the Icon children and what are they supposed to destroy, but I managed to know it before it's too late. I like how this book twisted my brain cells. When it comes to their power, it's kind of familiar, just in the part of the feelings thing, but the other parts is nice though I'm not aware of their full power, hope there will be more! It'll be awesome if there is. Anyway this book has so many unanswered questions, but I hope it'll be answered in the second book. Dol and Ro lived in the same place in La Purisima, childhood friends as they say, they've been together ever since The Day happened. Things changed a lot since they were captured by the Embassy, many people died again from that event. Dol, Ro, Tima and Lucas were gathered together for a secret reason which they are about to find out. Dol became interested to Lucas for some reason and it caused a change between her relationship with Ro. Mind thrilling and confusing book, it's a kind of book where you want to find answers in everything. I enjoyed reading this book, and when I found out about the second one coming sometime soon, I really can't wait. I don't like much the part where Dol chose Lucas over Ro! why??? Before I end this, I wanna share to you guys my signed book of Icons and my photo with the author herself! 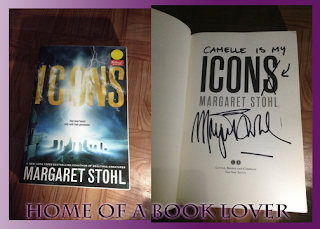 :) I went to the book signing last September 14, 2013 and I got lucky to meet her in personal.